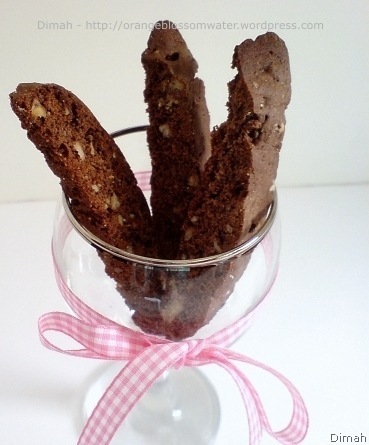 This biscotti is addictive, it combines two of my favorite things, vanilla bean and pecan! 1. Preheat your oven at 350 °F (176 °C). Place the nuts on a baking sheet, and place in the oven for 5 min. Remove and let cool before chopping them coarsely; set aside. 2. With an electric mixer, work the butter and sugar into a smooth paste. 3, 4. Then add the eggs, one after the other. Wait until the first is well incorporated before adding the second egg. 5. Add the second egg and beat. 6. Add the vanilla seeds, and mix. 7, 8. In a large bowl, mix flour, baking powder and salt. Add these dry ingredients to the previous batter, and mix only enough for everything to be homogeneous. 9, 10. Divide the batter in two halves, and add 2 tbsp cocoa to one, and mix. Divide the nuts between the two batters. 11. Shape each into a log (put flour on your hands to do so, as the batter is sticky). Place the logs on a baking sheet (I sprayed my baking sheet with oil), not too close to each other as they will expand, and flatten slightly into a rectangular. Cook for about 30 min. Remove and let cool for 20 min. 12. Reduce the oven temperature to 320 °F (160 °C), With a serrated knife, cut each log in 1/3″ slices at a slight diagonal, and place them flat on the baking sheet again. Cook for 10 to 15 more min. Remove and let cool on a rack. 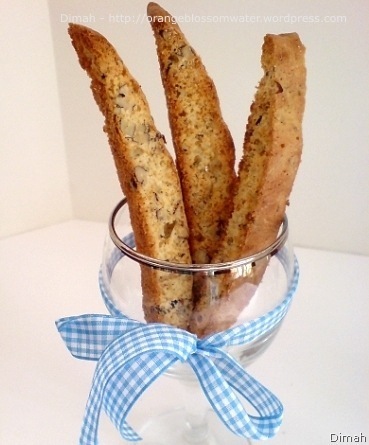 These biscotti keep well for a week in an air-tight metallic box. 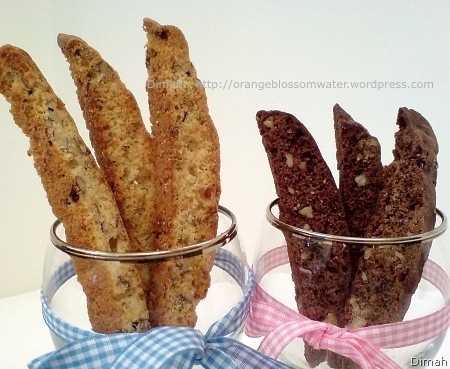 They keep a little less than similar biscotti without butter. Preheat your oven at 350 °F (176 °C). Place the nuts on a baking sheet, and place in the oven for 5 min. Remove and let cool before chopping them coarsely; set aside. 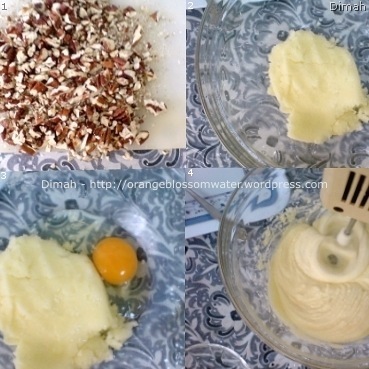 With an electric mixer, work the butter and sugar into a smooth paste, then add the eggs, one after the other. Wait until the first is well incorporated before adding the second. Add the vanilla seeds, and mix. In a large bowl, mix flour, baking powder and salt. 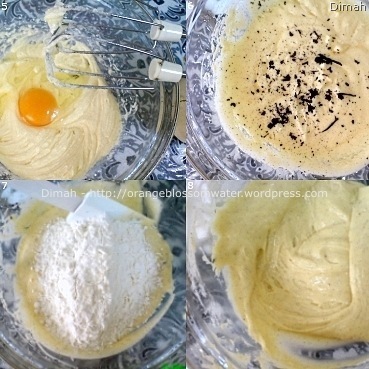 Add these dry ingredients to the previous batter, and mix only enough for everything to be homogeneous. Divide the batter in two halves, and add 2 tbsp cocoa to one, and mix. Divide the nuts between the two batters. 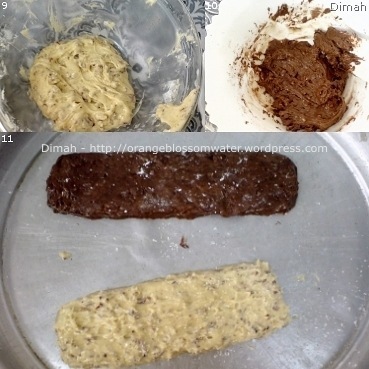 Shape each into a log (put flour on your hands to do so, as the batter is sticky). Place the logs on a baking sheet (I sprayed my baking sheet with oil), not too close to each other as they will expand, and flatten slightly into a rectangular. Cook for about 30 min. Remove and let cool for 20 min. Reduce the oven temperature to 320 °F (160 °C). With a serrated knife, cut each log in 1/3″ slices at a slight diagonal, and place them flat on the baking sheet again. Cook for 10 to 15 more min. Remove and let cool on a rack. This entry was posted on Saturday, May 9th, 2009 at 8:30 PM	and is filed under Baking and Desserts. You can follow any responses to this entry through the RSS 2.0 feed. You can skip to the end and leave a response. Pinging is currently not allowed. They look so elegant! I love your photos Dimah! I also really enjoy the way you structure your recipes, very easy to follow. 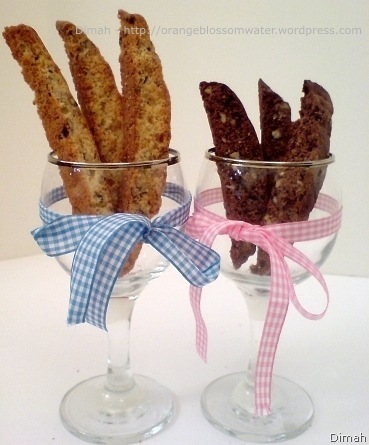 I love making biscotti for gift bags for co-workers or hostess gifts, they’re just so classy! What a beautiful presentation! 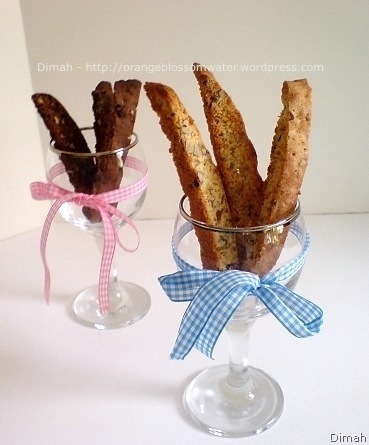 Are these biscotti common in Syria? It says to add “two flours”, but the recipe only lists one. Would love to try these, but need some clarification on the recipe. Marta: Thanks for the compliment! you are so sweet. I agree with you, they are great as a gift! Nifty Noshing: No, they are not common in Syria. Thanks for dropping by! Nora: I’m sorry for the mistake! The original recipe used 1/2 cup quinoa flour + 1/2 cup brown rice flour, so I changed the recipe to 1 cup all purpose flour, and forgot to change the instructions. 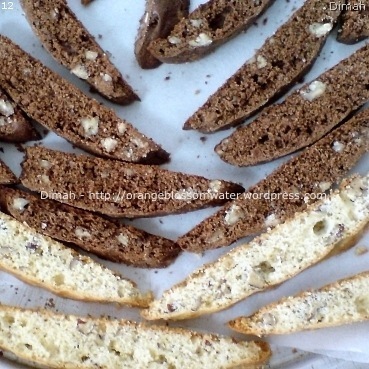 Your biscotti look wonderful and delicious! 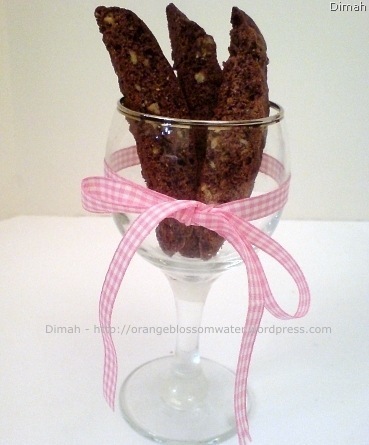 Made these today – they are delicious!!! How pretty and very very tasy. I want some. 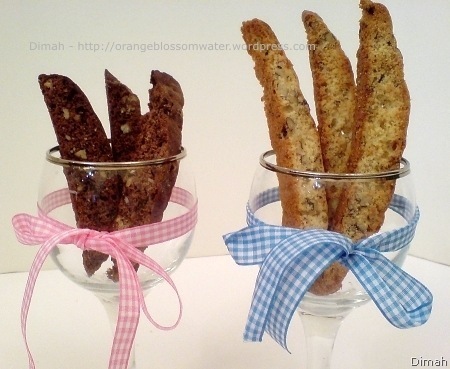 Are you having a biscotti party anytime soon? 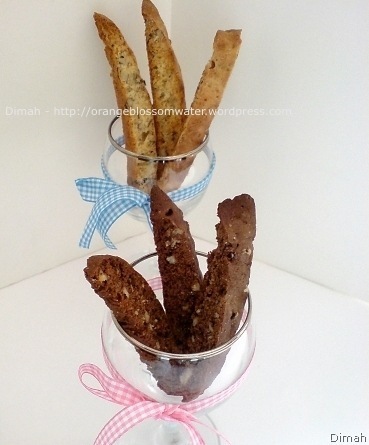 Your biscotti look great! Those are great flavors. I wish I would have come across this before Mother’s Day, I would have insisted my kiddos and husband make these little gems for my Mother’s Day breakfast or mid-morning snack…there’s always next month for my 34th birthday…and or before!!!!!!! Thanks so much for sharing! pinkstripes: Thank you for stopping by! Nora: Thanks! I’m so glad you liked it! Claudia: Thanks! 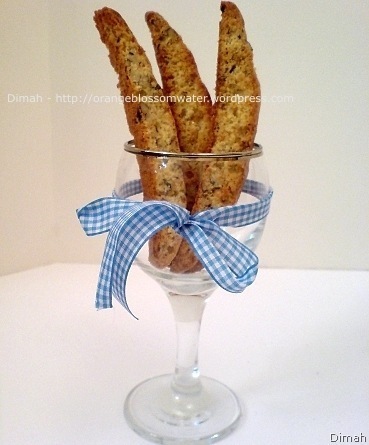 I wish you lived nearby, then we can have a biscotti party together! lisa: Thanks for visiting my blog. It’s a pleasure to read your comments! Latrice: Thank you so much! I hope you try them! Happy *early* birthday. Lovely! I’m sipping a cup of espresso right now and wish I have one of your biscottis to nibble on! Hi dima , that looks yummy . Where did you find pecans in Syria ?